Over the last few days, most iOS users have experienced the same peculiar bug: the letter “i” was autocorrecting to… something else. Sometimes it was an exclamation mark. Sometimes it was “A.” Sometimes it was a question mark in a box. A fix was said to be just around the corner, and sure enough: Apple has just sent out a patch that fixes that rando-replacement once and for all. 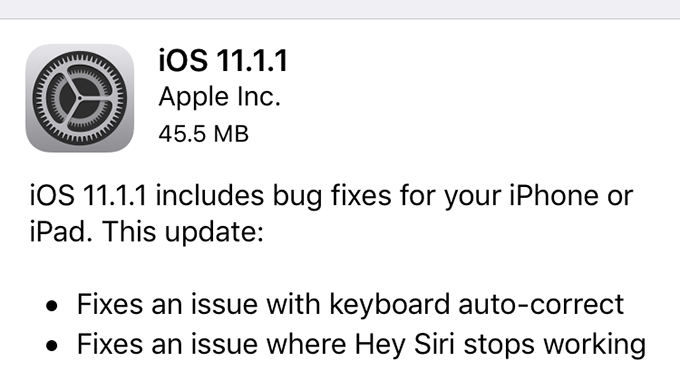 iOS 11.1.1 is now available, with this fix marked as the flagship feature. Apple quickly put up a support page with a temporary fix for those who went looking for answers — but as you’ve probably still seen about a zillion tweets and Facebook posts with stray ⍰ in the days since, it would seem most people didn’t. This fix should be a bit more universal. Need the update? Just pop into Settings > General > Software Update and let iOS do its thing.